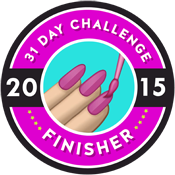 Paints And Polish: Dear diary July 25: Oh no I broke a nail! Ok, so it wasn't so much a break as a crack or a split. Nonetheless, repairwork is necessary unless I want to <choke> cut it off and file it down. First, glue the split nail back together and wait for it to dry. After the glue dries, smooth the surface with a bit of light buffing. Time to cut a piece of silk wrap and glue it to the area. Repeat the process to make a stronger bond and harder nail. Then buff the nail to smooth the surface and file. Shiny and good as new. Nail rescued, problem solved. I feel much better now.